Transcriptions * Lessons * Bios * Photos. Guitar Book. Jazz Instruction. Softcover Audio Online. With guitar tablature. 192 pages. 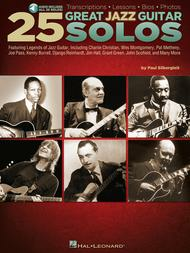 Published by Hal Leonard (HL.703668). From Charlie Christian and Django Reinhardt to Wes Montgomery, Pat Metheny, Kenny Burrell and beyond, take an inside look at the genesis of jazz guitar. 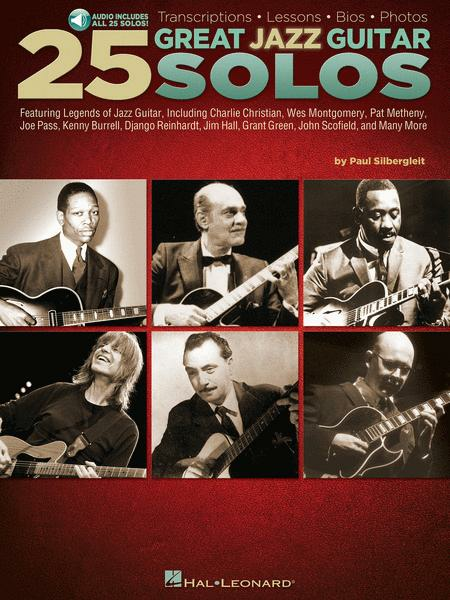 The book and audio compendium provides solo transcriptions in standard notation and tablature, lessons on how to play them, guitarist biographies, equipment, photos, history and much more. The accompanying audio contains full-band demonstrations of every guitar solo in the book! Songs include: Days of Wine and Roses (Pat Martino) • East to Wes (Emily Remler) • Embraceable You (Oscar Moore) • I've Found a New Baby (Charlie Christian) • Like Someone in Love (Tal Farlow) • Lover Man (Oh, Where Can You Be?) (Joe Pass) • Lullaby of Birdland (Barney Kessel) • Nardis (Mike Stern) • Nothing Personal (Pat Metheney) • Orange, Brown and Green (Herb Ellis) • Whisper Not (Jim Hall) • The World Is Waiting for the Sunrise (Django Reinhardt) • and more.